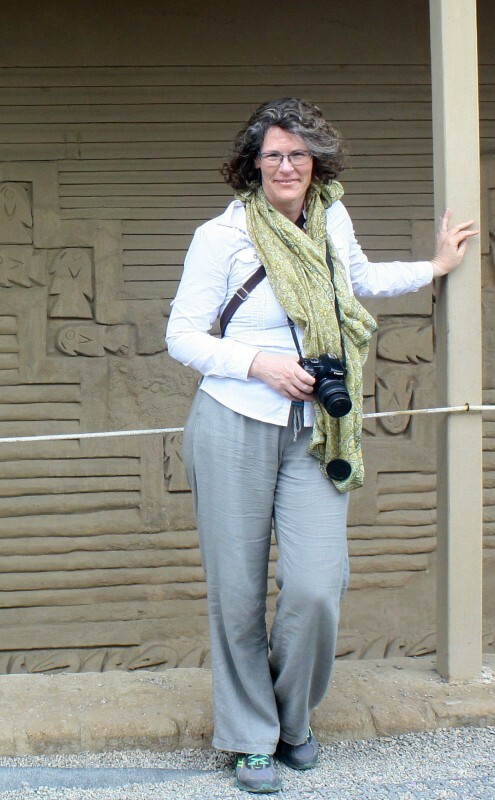 Dr. Jo Burkholder is an archaeologist whose work focuses on cultures of the ancient Andes. She has excavated at several different sites in Peru as well as along the shores of Lake Titicaca in Bolivia. Jo has travelled widely in the Andes to better understand sacred geography – the relationship between people and the sacred sites they create – and the roles of women in the creation and maintenance of that geography. This has included studying the roles of gender in rituals as well as a detailed consideration of the iconography found on ritual ceramics and textiles. Her publications include the forthcoming “Mothers and Others: Female Images and Life Cycle Rituals in the Southern Andes” in Images in Action: South Andean Iconographic Series, from Cotsen Institute of Archaeology Press. Jo’s most recent field projects include excavations at two small temples at the sanctuary site of Pisanay (A.D. 1000-1300) in the Department of Arequipa, and an experiment to date geoglyphs on the desert coast of Paracas using optically stimulated luminescence, a technique she hopes to employ to better understand the evolution of sacred geography in the Sihuas, Majes, and Vitor Valleys of southern Peru. She currently serves as Associate Professor of Women’s and Gender Studies and Coordinator for Anthropology at the University of Wisconsin – Whitewater, where she teaches courses on Pre-Columbian Civilizations and the Origins of Gender as well as mentors undergraduate researchers in a variety of fields.